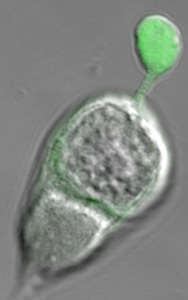 A photoreceptor cell with green synaptic vesicles. The Laboratory of Neuroendocrinology - Molecular Cell Physiology is part of the Institute of Pathophysiology, Medical Faculty, University of Ljubljana, Slovenia. The longterm program of the Laboratory of Neuroendocrinology, is to study molecular mechanisms of regulated exocytotic hormone secretion. The function of a single cell is studied by electrophysiological techniques of patch-clamping, where the secretory activity is monitored by changes in membrane capacitance. Since cytosolic calcium activity is the trigger of exocytosis in excitable cells, fluorescence (photometric and imaging) methods are used to measure changes in cytosolic calcium. Caged calcium photolysis is used to produce a step change in cytosolic calcium. A method was developed to quantify the interaction between a single secretory granule and plasmalemma, detected as discrete steps in membrane capacitance (femtofarad steps). A combination of molecular biology and electrophysiology approach was adopted to inhibit expression of monomeric GTP-binding proteins. Confocal microscopy is used to study molecular mechanisms of regulated exocytosis in endocrine cells, astrocytes and photoreceptors. We also use confocal microscopy to evaluate our bioengeneering products. - FEPS 2009 – The physiology meeting organized by The Slovenian Physiological Society, The Austrian Physiological Society, and The Federation of European Physiological Societies. 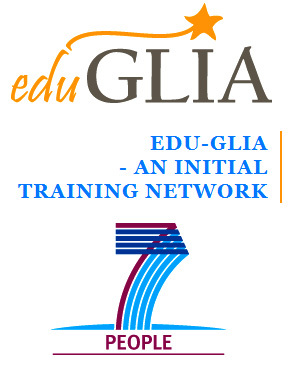 - International Meeting "Mechanism(s) of Exocytosis 2008" and "15th Young Neuroscientists Meeting"
Edu-GLIA is an Initial Training Network (ITN) funded by the European Commission under the Seventh Framework Programme (FP7).